One of the interesting things about long term relationships is you continue learn about your partner, and yourself thru them. For example, my husband and I were driving to the supermarket the other day and I brought up the saying “first is the worst, second is the best, third is the blue bird sitting in the nest” (alternate ending is “third is the man with the hairy hairy chest”)… He had never heard this before! Granted, he grew up all over the place but not here, where I did. So I figure this must be a regional saying. I know for a fact Ro Sham Bo is SF regional, but that’s a game not a saying. Rock, paper, scissors is what everybody else calls it. But then I wondered about other kid rhymes. “No cuts, no butts, no coconuts”? Nope. I asked what he said to the kids who cut in line, and he didn’t offer much by way of explanation. I didn’t even bother with the girl oriented ones like “Cinderella, dressed in yella, went downstairs to kiss her fella, by mistake she kissed a snake, how many doctors did it take?” I can pretty much guarantee my honey did not double dutch. Just now I thought of “trick or treat, smell my feet, give me something good to eat”, he’s got to know that one, right? I’m texting him STAT. BREAKING UPDATE: he knows the trick or treat one! 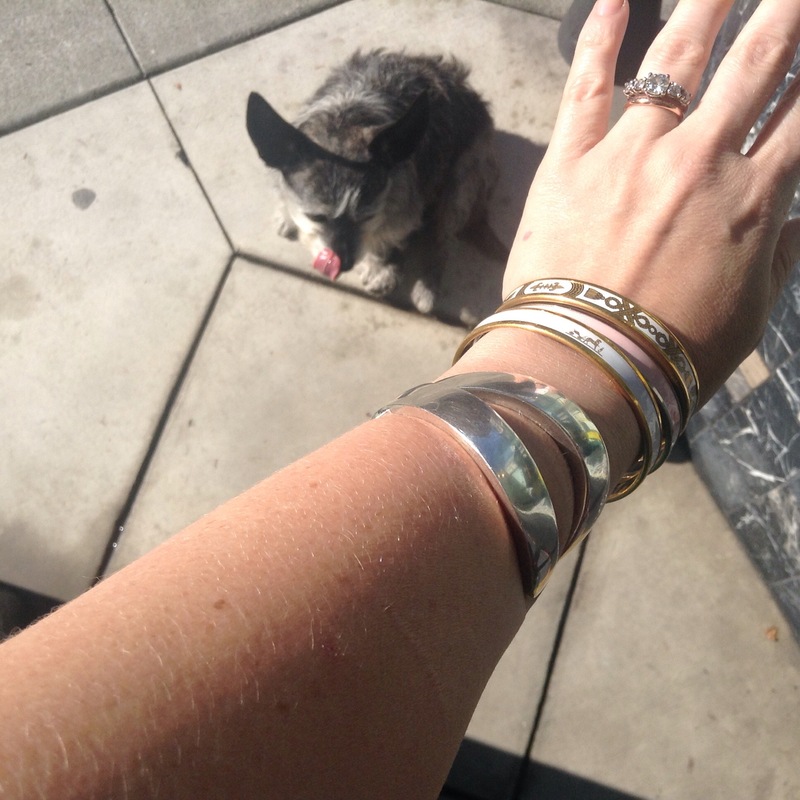 Today’s bangles are my Elsa Peretti X, a skinny white Calèche, a skinny pink Calèche, and the skinny white Grand Apparat. What did you say as a kid? Do you recognize any of mine? I know the hairy chest, but never heard the blue bird. I know RoShamBo (let’s go Giants!) and Cinderella, but never heard no coconuts. I can’t think of any more right now, but there is lots. I have thought about how some of these saying get passed down through kids on the school playground through generation after generation. It is possibly the most effective way to keep a saying alive over time. Kids just learn and repeat. That’s an interesting theory. Maybe the history of children is an oral one? But “history” do children have except playground rhymes. Yay RoShamBo, I have a theory on it. There are multiple playgrounds around San Francisco named Roshambeau, after some explorer. I always assumed there was a connection, maybe our two theories combined explains RoShamBo? Really? I didn’t know that. I think that’s a plausible explanation. I only know Cinderella & trick-or-treat. We said the “baby baby stick your head in gravy wash it off with bubblegum and send it to the navy” thing. That’s a good one, was it a jump rope song? Probably but we just sang it whenever. We also sang “fork, spoon, knife” over and over which is really stupid! HAHA! That is hysterical. I hope this girl is a standup comic now.